The stylish restaurant VAU in Berlin, Germany not only has a Michelin-star to its credit, its' owner and Chef Kolja Kleeberg looks like a rock star and cooks like an inspired angel! Having dinner at VAU is an experience in contemporary style beginning with the domed wood ceiling made of Swiss pear, the floor made of American oak, continuing to the white linen draped tables where tall white tapers stand in tall thin gold candlesticks and white orchids grace the tables, and I haven't even begun to speak about the real reason one comes to VAU, and that is the food. Sipping champagne and munching on crostini and bowls of seasoned almonds, Edward F. Nesta and I looked over the brilliant menu in March 2006, and knew that our taste buds were in for a special treat. Our waiter brought us a bowl of cottage cheese mixed with paprika, gherkins, capers, salt, pepper and lemon juice to spread on the warm miniature rolls, and when I selected one with a pretzel-like taste, I sighed with delight. Chef Kolja began our tasting menu by sending us an Amuse Bouche of Bacalau VAU, codfish with baked brandade with blood orange, olive and fennel, and a decadent tiny tease of caviar, providing a really wonderful melding of flavors that worked well together. He followed that with Marinated John Dory and saffron risotto, which consisted of 2 tiny slivers of John Dory sprinkled with herbs on a bed of saffron risotto topped with a finishing salt. The restaurant was busy, yet the professional restaurant team dressed in tuxedos worked as smoothly as clockwork with dinners served by Chef Kolja and the team, with plates removed so effortlessly, it was almost as if by magic. As I watched Chef Kolja in action, I could see that he was clearly in his element enjoying the nightly performance of creating perfect cuisine for an appreciative audience. He also has a sense of humor, and when I went wandering in the restaurant, he stood at the top of stairs and called out "Wrong way Debra, come back, your lobster is waiting," and of course, I immediately returned to my table laughing. 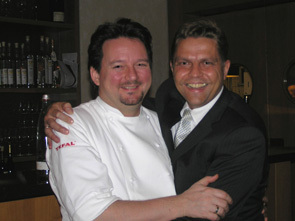 Sommelier Henrik Canis and Chef Kolja are a harmonious duo creating food and wine pairings. 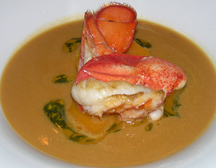 For the Roasted lobster in shellfish fond with pumpkin, ginger and tarragon, Henrik paired a 2004 Randessackes Sonenstuhl Scheutebe Spatlese Trocken Schmidts Kinde, Frankonia. This was an exquisite dish with a heavenly broth, and my only complaint when I finished the more than ample portion, was that I wanted just a little bit more. Poached char in turnips-Riesling-fond with horseradish was paired with a 2004 Rudesheimer Berg Schlossberg Riesling Spatlese "VAU" Johannes Leitz Rheingau. Chef Kolja proved his genius with sauces with his horseradish foam with the smoked char. I kept waiting to be a bit let down with any part of our meal, but thus far, my expectations had been more than met; VAU and Chef Kolja shine. Halibut with two preparations of salsify and cocoa was paired with a 2001 Chardonnay, Fritzbecker, Palatinum with a rich oakiness that bordered on a smoky taste. The halibut was presented on a bed of two cooked black salsify topped with crispy shaved salsify and a crunchy cocoa foam on the side, offering lots of taste and texture to this dish. 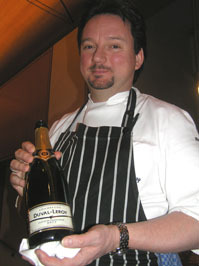 Henrik paired Braised and roasted Bavne-veal with celery and beans cassoulet with a 2003 Cuvée "V" Weingut Gerhard Aldinger Würtenberg. This was a "serious" red wine with 14% alcohol that had a peppery, earthy nose that was a big, bold wine with lots of tannin that was so dry I could feel it on my teeth. Henrik told us, "My work is to drink wine, and my hobby is to make wine," with this wine coming from his "hobby." We continued with a very moist and flavorful Sea bass roasted with the skin on, with onions in a port sauce with diced tomatoes, pumpkin, potato and pumpkin seeds, and a Guinea fowl served with a polenta stick and radicchio in a port reduction sauce with nuts and mushrooms. We savored our cheese course of Vacherin Mont d'Or with pear and hazelnuts, which was served with warm tiny diced pears, that was perfectly paired with a 2001 Philippi Pinot Noir "R", Koehler Ruirecht, Palatinum, as this tangy cheese needed the boldness of this German wine. The evening ended on a sensational high note with Braised pineapple with lemongrass hot pepper sorbet and caramelized olive, paired with a 2003 Schwarzhofberger, Riesling Kabinett Egon Tuiller, Saar. This stellar dessert combined sweet and savory flavors and "pushed the envelope" yet definitely came together beautifully. 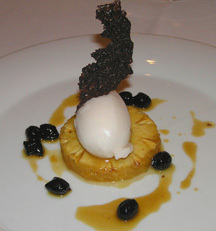 The lemongrass hot pepper sorbet was a "wow" with Asian flavor packed intensity, the caramelized black olives added another layer of complexity and flavor, and the braised pineapple brought a level of balance into this anything but ordinary dessert. We came to VAU seeking excellent cuisine, and walked out into the night duly rewarded after an exciting evening of culinary adventures. Please read Chefs' Recipes for an interview with Chef Kolja Kleeberg where he shares his exciting recipes in English and German, and the other articles on Berlin in the Destinations, Hotels and Resorts, Restaurants, Arts and Antiques and Music Scene sections.